As 2012 closed and 2013 began, I examined myself, my family, our home, our faith, our school, and I made a decision. I want 2013 to be about me becoming more self-controlled, a more involved wife, a more fun mom, a more prepared Bible teacher, and a more flexible homeschooler. In a nutshell, I wanted to make myself and everyone in my small sphere of influence happier. Our days more joyful and less stressful. Our time together more meaningful and intentional. Then one cold December day as I’m leaving our local library a book catches my eye. I check it out, read it, and love it. I love it so much that I didn’t immediately do any of the changes mentioned in the book. I didn’t follow through on any projects. Why? Because I wanted to share it with all of you. So once or twice a month (I haven’t decided yet!) 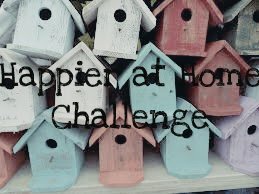 my Mama Monday posts will be focused on completing a challenge, The Happier At Home Challenge based on the book by Gretchen Rubin which was my inspiration. If you would like to have a happier home, then join me on this year long path to make our lives, our spouse’s lives, and children’s lives happier and more joyful. Check out the book from your library, purchase it, or borrow it and start getting happy! Assignment #1: Read the first chapter, Preparation, in Happier at Home. I’m so looking forward to this challenge and hope some of you are as well. If you blog, I would love to have you link up. If you are merely a participant, then please leave comments on the Happier at Home posts to let me know how it’s going.